The simplest layer of security for the Admin console is to add login credentials via the Admin settings. For added layers of security, you can remove your XML from the file storage manually to protect sensitive information that can be stored there. 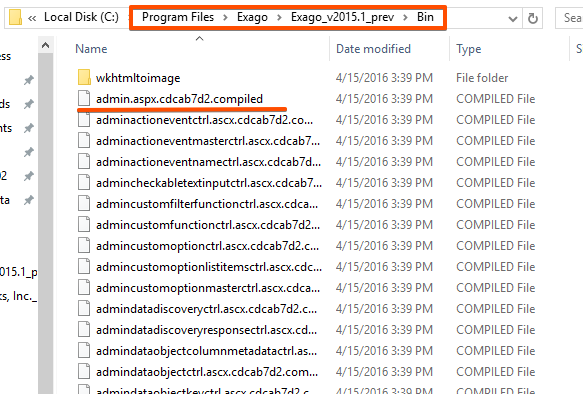 By navigating to your install path of Exago and opening the Config folder, you will find both the Webreports.xml as well the Webreports.xml.enc. When the Webreports.xml is removed from this location Exago will instead use the Encrypted xml. that is created and updated any time changes are made to the WebReports.xml. Note. 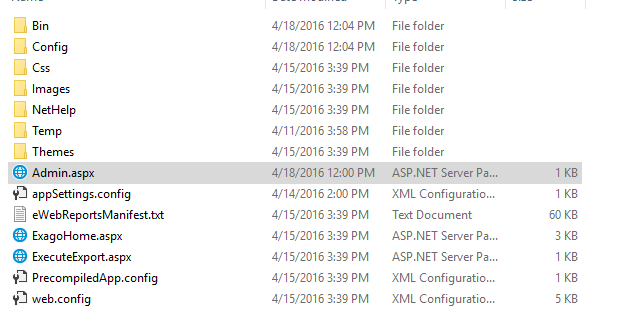 Make sure to store your WebReports.xml somewhere secure for any later adjustments. For added security you can make the Admin page completely inaccessible. The file stored here (the first file under the folder 'wkhltmltoimage'), when relocated or renamed, will remove access to the Admin.aspx page. Above is the default text and an added text for this example. Below is what appears when navigating to the page.